The leaks are comin' fast and furious tonight. Details and photos of the 2010 Jaguar XKR have leaked ahead of the Detroit Auto Show. Here's the scoop on Jag's new 510 HP grand tourer. The new Jaguar XKR is a sophisticated grand tourer with the heart of a true sports car, combining effortless high-performance and state-of-the-art V8 powertrains with a new level of advanced technologies, intuitive control and Jaguar's superbly crafted, new-fashioned luxury interiors. The range comprises naturally aspirated XK and supercharged Jaguar XKR models, available in 2+2 coupe or convertible body styles. All-new AJ-V8 Gen III 5.0-litre direct-injection engines bring significant improvements in power and torque and they do so without compromising fuel economy and emissions. In both respects, every model in the new XK range, in spite of such large performance and flexibility gains across the board, is comparable to their predecessors. The impressive fuel economy for such powerful cars is attributable to the combination of the XK range's lowest-in-class weight and the all-new AJ-V8 Gen III engines. As well as the intrinsic advantages of the engines' light weight, these advanced all-aluminium four-cam power units have a number of features that deliver power with very high efficiency, including spray-guided direct injection (SGDI), which improves performance and economy, and dual independent variable cam timing (DIVCT), which benefits performance and economy, while also reducing emissions. The simplified and logical model range for the new XK comprises three clear choices - XK, XK Portfolio and supercharged Jaguar XKR. Each has its own specific choices of trim, colour and fine detail, but every one has the same underlying sporting character and clear emphasis on efficient performance, luxury and craftsmanship. Beyond that, the XK vehicle personalisation programme also offers an extensive range of accessories that allow the customer to add further bespoke touches, both inside and out. In naturally aspirated form, the new AJ-V8 Gen III 5.0-litre engine delivers 385PS (SAE) and 380lb ft (515Nm) of torque - respectively 26 and 23 percent more than its 4.2-litre predecessor. The Jaguar XKR's supercharged 5.0-litre version delivers a mighty 510PS (510bhp SAE) and 461lb ft (625Nm) of torque - improvements of 23 and 12 percent respectively over the supercharged 4.2-litre engine. On the road, while maximum speed remains under electronic control at 155mph (250kph), these power and torque gains allied to the lightweight aluminium body architecture of the XK dramatically improve acceleration times. For the naturally aspirated XK, 0-60mph is reduced to 5.2 seconds from 5.9 seconds (and 0-100kph from 6.2 to 5.5 seconds); for the supercharged Jaguar XKR, 0-60mph is reduced to 4.6 seconds from 4.9 (and 0-100kph to 4.8 seconds from 5.2). The supercharged Jaguar XKR is also impressively efficient, with combined fuel economy of 23.0mpg and a CO2 rating of 292g/km - an improvement over the previous Jaguar XKR - and 16 and 17 percent better, respectively, than the equivalent figures for the BMW M6. Crucially, however, the naturally aspirated XK also continues to better its closest rivals on economy and CO2 ratings, with an average consumption of 25.2mpg and a CO2 figure of 264g/km - seven percent better than the equivalent figures for the Mercedes-Benz SL500 thanks to its fuel efficient engine and significantly lower kerb weight: 1660kg compared to the SL500's 1845kg. Visible changes on the new XK and XKR reflect the significant changes under the skin. Carefully revised exteriors take the seductive, elegant lines that define Jaguar's new design language and interpret them for a beautiful 2+2 sports car whose shape is even more taut, powerful and athletic. Evoking the essence of performance long before it moves, the new XK family shape is unmistakably 'new-school' sporting Jaguar: wholly contemporary, finely sculpted, efficiently packaged and precisely detailed. The exterior changes for the naturally aspirated XK models and the supercharged Jaguar XKR are highlighted by a distinctive and purposeful new front end design, new LED rear lights and a new lower rear body valance. New LED rear light clusters incorporating fog lamps plus twin reversing lamps (rather than the previous single lamp units) give every new XK a unique 'night time signature', while LED technology is also included in the integrated side repeater and approach lamps in the new exterior mirrors. Every new XK also features revised body-coloured side power vents. Beyond the shared changes, subtle differences in detail distinguish each of the three models in the new XK range. All display purposeful front bumper features with stylish, chrome-detailed inserts and further chrome detailing to the upper mesh grille. The Jaguar XKR is set apart by also featuring chrome on its lower mesh grille - which is finished in black on the XK and XK Portfolio models. All models now feature chrome detailing on window surrounds and rear signature blade, and in addition the Jaguar XKR comes with a new lower rear valance that is finished in body colour and a revised tailpipe design, further emphasising its sporting performance. Contemporary, sporting luxury, exceptional quality of craftsmanship, and Jaguar's renowned attention to detail are the keynotes of the new XK range's enhanced interiors. The cabin is clean, elegant and spacious, and remains entirely in harmony with the sporting character of the revised exterior. The luxury character of the new XK and XKR, however, is guaranteed, regardless of the customer's choice of body style - hard-topped coupe or fabric-roofed convertible. Both benefit from the inherent strength of Jaguar's lightweight aluminium architecture, which means that as well as being the lightest body structure in its class, the body shells also have the highest torsional strength. And that exceptional rigidity, with or without a fixed roof, means creak and rattle-free refinement, even on unforgiving surfaces. Beyond that, the convertible's triple-lined fabric roof gives a level of fit and stability, even at very high speeds, that minimises wind noise and other road noise and includes a luxurious interior finish almost indistinguishable from a fixed roof. 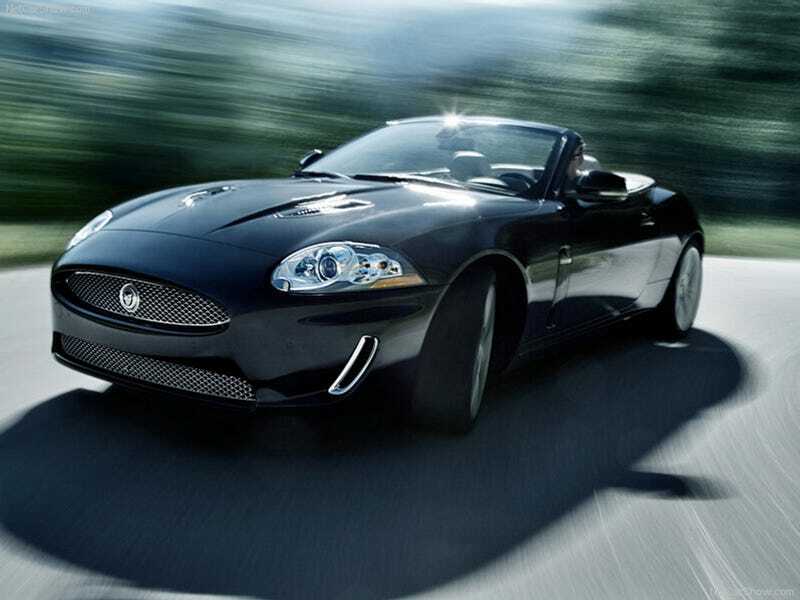 In addition, XK Portfolio and XKR models feature luxurious Jaguar Suedecloth headlinings as standard. The folding roof can be powered up or down at the touch of a button in less than 18 seconds. And when it is lowered, the convertible's flush-folding roof retracts completely into the bodywork behind the rear seats, under a smooth cover that retains the elegant, sporting lines of the car. A roll-over protection system, which remains hidden unless it is needed, deploys instantaneously as necessary to provide occupants with the highest levels of protection in the event of an incident. For both coupé and convertible, the latest feature enhancements are showcased by the JaguarDrive Selector™, which is neatly and elegantly packaged in the centre console. The welcome to the car is also enhanced by new, bright treadplate inserts. Many of the other changes emphasise high levels of Jaguar craftsmanship with new jewel-like touches. The three-spoke steering wheel now has a leather-wrapped lower spoke, and Jaguar's striking 'growler' badge. The new Jaguar XKR's instruments further emphasise its performance character with red pointers, while all models adopt a new white illumination for their instruments. New heated and cooled front seats are standard equipment on the new XK Portfolio and on XKR with the optional R Performance interior (dependent on market), and available as an option on the XK. The XK features 10-way seat adjustability for both driver and passenger seats, with heating and memory functions as standard - while the Jaguar XKR seats have similar functions but with the unique R seat style. The XK Portfolio and XKR with the optional R Performance interior have 16-way adjustable seats with heating and memory functions, adjustable side bolsters and new cooled seats as standard. twin-needle stitching and a soft-feel interlayer. In each door, the modified seat switch pack now includes single-piece chrome 'highlight' switches. There is a wide choice of interior colour options, including a new combination for the XK Portfolio and XKR of Ivory seating with Oyster upper cabin trim and Oyster carpets. Bond grain leather is standard on the new XK interior, and an even higher quality soft-grain leather with contrast stitching is standard in the XK Portfolio and the new R Performance Jaguar XKR. Real wood veneers remain an important part of Jaguar craftsmanship and now include a new Rich Oak veneer option alongside the classic Burr Walnut for all three models. The new XK Portfolio also offers the choice of an Ebony veneer, while the Jaguar XKR offers its own unique alternative in Dark Oak. A Knurled Aluminium veneer is also available on XK and XK Portfolio, while Dark Mesh Aluminium is available on XKR. Globally recognised as one of the key elements in Jaguar's intelligent use of advanced technologies, the XK's industry-leading lightweight architecture constructs the entire body shell (the internal chassis structure and external body panels) from a combination of pressed, cast and extruded aluminium alloy components. These are riveted and bonded together using techniques originally developed in the aerospace industry and adapted for automotive use by Jaguar. The result is a body shell with a depth of quality that is rooted in the highest structural integrity. It is also the lightest shell in its class by a significant margin and the most torsionally stiff. That all-round strength, rigidity and lightness underpin many aspects of the XK's excellence, from fuel-efficient performance to its inherent safety, durability and refinement - and, of course, its precise chassis dynamics. Since the first XK was launched in 1948, generations of powerful yet refined engines have played a crucial role in establishing the unique character and pedigree of Jaguar cars. Now, the new 5.0-litre V8 direct-injection engines continue that tradition, delivering increased power and torque with reduced emissions and impressive fuel economy. Available in two versions - the supercharged 510PS and naturally aspirated 385PS - the new AJ-V8 Gen III engines exemplify Jaguar's reputation for innovation and engineering excellence. The results are clear to see. Performance has been increased by 29 percent and 23 percent (87 and 94PS) on the naturally aspirated and supercharged engines respectively, yet both meet EU5 and US ULEV2 emissions regulations. Despite the significant increases in power, both have better emissions and comparable fuel economy to the previous 4.2-litre units. Both new AJ-V8 Gen III petrol engines are state-of-the-art in every sense. The technical features have been engineered to deliver unparalleled efficiency, refinement, power and torque for which Jaguar is famous, combined with the lowest possible emissions. Low-speed torque characteristics and throttle response are world-class, while the supercharged version is one of the most economical 5.0-litre V8 engine available. The new AJ-V8 engines are built around a stiff, all-new, aluminium block with cast-in iron liners and cross-bolted main bearing caps to reduce noise, vibration and harshness. The blocks are high pressure die-cast, providing a superior finish and greater dimensional accuracy. The engines use aluminium heads, with four valves per cylinder and spheroidal-graphite cast-iron crankshafts and forged steel connecting rods. The cylinder heads for the first time are specified with a secondary (recycled) aluminium alloy thus reducing the environmental impact of manufacturing the new engine. The new 5.0-litre direct injection petrol engines are more compact than their predecessors. Overall engine length has been reduced by 24mm by relocation of the oil pump within the engine architecture. This length reduction - apparently a small amount - improves engine bay packaging in support of enhanced safety cell performance while ensuring overall engine weight is virtually unchanged. A sixth-generation, twin vortex system supercharger is fitted to the Jaguar XKR's 510PS engine. It is a compact Roots-type unit, feeding air through twin intercoolers, which in turn are water-cooled by their own discreet cooling circuit. The high helix rotor design improves the supercharger thermodynamic efficiency by 16 percent over its predecessor. It also improves noise quality to the point where the unit is now virtually inaudible (making supercharger whine a thing of the past). The intercoolers reduce the temperature of the pressurised intake-air and so optimise power and efficiency. The new air intake has been radically redesigned compared to the previous V8. The intake air path is a direct feed to the supercharger inlet from the centrally mounted front throttle body. Air is delivered through twin air boxes, which reduce flow loss and further increase efficiency. Mechanically, the new supercharger and its intercoolers are efficiently packaged in the 'V' of the engine to deliver a lower overall engine height in support of pedestrian safety requirements. One of the key features of the new petrol engines is an industry-first, centrally-mounted, multi-hole, spray-guided fuel injection system, delivering fuel at a pressure of up to 150bar directly to the cylinder. This substantially contributes to improved low-speed, dynamic response. The positioning of the injectors ensures fuel is precisely delivered to the centre of the combustion chamber, maximising air-fuel mixing and improving combustion control. Fuel is delivered via twin, high-pressure fuel pumps that are driven via auxiliary shaft in the all-new engine block. The charge cooling effects of the direct-injection fuel system have allowed the compression ratio of the naturally aspirated engine to be raised to 11.5:1, further optimising the engine economy. The supercharged engine also benefits from a compression ratio increase to 9.5:1 from 9.0:1 in the previous 4.2-litre. During the engine warm-up phase, the combustion system employs multiple injection mode strategies to deliver 50 percent more heat for fast catalyst warm-up and emissions reduction. A new type of variable camshaft timing (VCT) system introduces another new technology. The four VCT units are activated by the positive and negative torques generated by opening and closing the intake and exhaust valves, instead of by oil pressure. This has allowed the engine oil pump to be reduced in size, saving energy and improving fuel consumption. VCT units work independently on all four camshafts with 62 degrees of authority on the inlet cams and 50 degrees of authority on the exhaust cams. Timing is optimised by the engine control unit for torque, power and economy at every point in the engine's speed range. The new VCT units are capable of a response rate up to three times faster than in previous Jaguar engines, with actuation rates in excess of 150 degrees per second. This delivers a more immediate engine response to the driver's demand for power. The naturally aspirated engine is also equipped with camshaft profile switching (CPS) on the inlet camshaft. Depending on the engine's running conditions and the demands of the driver, the CPS will switch between a profile that is ideal for low-speed driving and another which gives increased valve lift for high performance. Hydraulically-actuated two-piece tappets switch between profiles on the tri-lobe camshaft altering both the lift and duration. The cam lobe profile selected for lower engine speeds has a duration of 214° and lifts the valves 5.5mm. This optimises gas velocity for improved low-speed torque and reduces valvetrain friction for improved fuel economy. For high-speed driving, CPS switches to a cam lobe with a duration of 250° and valve-lift of 10.5mm, allowing greater air flow for high power. Switching is activated at 2800rpm at high load, ranging to 4500rpm at light load conditions. A new variable inlet manifold (VIM) on the naturally aspirated engine can vary the length of its eight inlet tracts to optimise power and torque throughout the rev range. Vacuum-operated actuators open valves to select a longer, 680mm, inlet tract at low revs, increasing the rate of both the airflow and the engine torque. As the revs climb beyond 4700rpm, the actuators select a shorter, 350mm path allowing a greater volume of air into the engine to optimise power. The actuator position is monitored by the engine control unit to improve torque throughout the engine speed range. Every component in both V8 engines has been optimised for efficiency, performance, low-end torque and reliability. An innovative reverse-flow cooling system design has been employed to deliver thermodynamic and friction improvements. The reverse-flow cooling system pumps coolant through the cylinder heads before it flows through the block and returns to the radiator. The resulting cooler cylinder heads allow more optimum, knock-free, ignition timings. In addition, the 22kW oil-to-water heat exchanger, packaged at the core of the engine, transfers heat from the coolant to the lubricating oil during warm up, bringing the oil up to operating temperature 14 percent faster than the cooling system used in the 4.2-litre V8. This improves fuel consumption in the crucial engine warm-up period by approximately one percent - again a small amount, but part of a package of efficiencies. Minimising internal friction is key to improving fuel consumption and CO2 emissions, and as such was a key aim when it came to the design of the engines. As a result, the new Jaguar AJ-V8 Gen III engines achieve another best in class, setting a new industry benchmark for cranktrain efficiency. service intervals from 10,000 miles to 15,000 miles (or 12 months). Both V8 engines are now fitted with an electronic oil-level indicator for added peace of mind. Sound quality is a key characteristic of all Jaguars and is one particular aspect that customers relish. With that in mind, Jaguar engineers have accentuated the acoustic feedback into the cabin in order to further enhance the driving pleasure. The XK's exhaust 'sound track' has been enhanced to provide a deeper and more powerful character that matches the increase in torque at low revs from the new engine. At higher engine speeds the intake acoustic feedback system combines with the exhaust system to provide more of that unique Jaguar sound quality character. In addition to the fully active exhaust system in which valves open to provide a more rewarding note, the new XKR has been engineered to provide an intake feedback system to enhance the V8 sound character commonly absent on supercharged engines. Intake manifold pressure pulsations are fed into an acoustic filter at the rear of the engine that is tuned to provide an edgy sports car 'crescendo' at high revs. The filter is controlled by the engine management system, which only allows the sound to enter the cabin under the appropriate driving conditions. The new intake feedback system combined with the fully active exhaust system provides the most exhilarating aural experience yet delivered on a Jaguar. Any transmission is a major factor in delivering the performance that drivers desire, while integrating with the engine to optimise emissions and fuel consumption. Jaguar's acclaimed electronically controlled, six-speed ZF 6HP28 transmission offers an unparalleled combination of driver control matched to virtually undetectable gearshifts. With control either from steering wheel-mounted paddles or full automatic mode via the JaguarDrive Selector™, the new XK range delivers exhilarating performance.The supercharged V8 engine with 510PS and 625Nm of torque transmits power through an uprated version of the ZF 6HP28, additional clutch plates and an uprated torque converter having been added to the transmission to accommodate the extra power. The transmission has a fully-adaptive shift system which delivers seamless gearshifts and balances performance and economy at all times. It also continually adapts to suit driving style, which can vary from sporting to more economical. Jaguar Sequential Shift™ suffers no torque interrupt, resulting in a smoother more powerful shift feel, and an almost instantaneous shift from the time the driver touches the shift paddle to the completion of the shift event. The high levels of torque produced by the new engines make it possible for the torque converter lock-up feature of the transmission to function at low speeds, without slip. This approach provides an additional fuel consumption benefit, contributing to the official combined fuel economy of 23.0mpg (12.3 l/100km) in the Jaguar XKR. The advanced design of the transmission also includes a torsional damper to absorb firing impulses from the engine, further smoothing the driveline. The transmission is designed to be maintenance-free with 'filled-for-life' fluid. Another first for Jaguar is the new Active Differential Control (ADC), the final stage of the supercharged V8 driveline. Designed to give improved traction and dynamic stability, the electronically controlled differential continuously adapts to both the driver's demands and the amount of grip available at each individual wheel. Operated by an internal electric motor and 'ball-and-ramp' mechanism, the differential contains a multiplate clutch which transmits or 'vectors' torque to the wheel with most grip and therefore maximises the car's traction. The multi-plate clutch assembly is designed to prevent excessive differential slip, but differs fundamentally from a conventional traction control system, which uses the brakes to counteract differential slip, after it has occurred. For the first time, the new XK range introduces the innovative JaguarDrive Selector™ as its transmission control interface. First seen on the Jaguar XF saloon, the JaguarDrive Selector™ features a rotary shift control which rises into the driver's hand as the car is started, to give intuitive, ergonomically efficient transmission control from a neat, space-efficient interface. The selector is, in fact, much more than just an unobtrusive yet completely practical solution to selecting an automatic gear mode. It also imbues the car with a strong driver 'handshake' - get into an XK and the start button in front of the JaguarDrive Selector™ pulses red, like a heartbeat; press this button to start the engine and the cast alloy JaguarDrive Selector™ rises into the palm of your hand. From there, automatic transmission functions are selected simply by turning the control with the fingertips. As an example, Drive to Drive Sport selection is accomplished with a simple push and turn action. Returning from S to D, the rotary control operates with spring-assistance, which eliminates the need to pull the Selector. It couldn't be simpler. And when the engine is stopped, the JaguarDrive Selector™ returns automatically to its Park position. As well as the convertible's hidden, automatic roll-over protection, every car in the new XK range features Jaguar's pedestrian deployable bonnet system (not fitted to Federal market cars). In the event of a collision with a pedestrian, the system raises the bonnet by 170mm in just 30 milliseconds to provide a clear space between the surface of the bonnet and the hard points underneath, to reduce the severity of injuries - particularly those to the head - while still allowing the new XK low bonnet line. An energy-absorbing bumper system also helps minimise lower leg injuries to pedestrians. Jaguar's Emergency Brake Assist is standard on the new XK and Advanced Emergency Brake Assist is fitted to all models with Adaptive Cruise Control (ACC). Advanced Emergency Brake Assist uses the ACC radar to calculate distance from and speed of approach to the vehicle ahead and pre-charges the brake-line pressure to minimise impact speed if a collision is predicted - with an audible warning to the driver. Every model in the new XK range includes front, side and thorax airbags, incorporating new technology which reduces the load on the occupant's body if the front airbag is deployed. Jaguar's Adaptive Restraint Technology System checks for seat occupation and seatbelt use, seat position, and the direction and severity of any impact, and uses all that information to determine the appropriate level of airbag deployment in any incident. Additionally, Jaguar's Protec front head restraint system can minimise whiplash in the event of a rear impact. The new XK range introduces five new alloy wheel designs, some of them replacing earlier designs, some completely new additional choices. Together, they bring the total number of alloy wheel options on the new XK range to seven. The standard wheel specification is dependent on market and model, but for most markets begins with Jaguar's 18-inch seven-spoke Venus design on XK models. The new 19-inch 10-'V'-spoke Caravela wheel is now standard on XK Portfolio and optional on XK. Again, depending on market, the all-new 19-inch 10-fan-spoke Artura design is available in painted or chromed finishes and in conventional or run-flat types, and these Artura wheels are offered as options on XK, XK Portfolio and (in run-flat form) also on XKR. Another all-new wheel, the 19-inch ten-spoke Tamana design, becomes standard equipment on Jaguar XKR for most markets other than the UK (which specifies 20-inch wheels), and is unique to this model. A new 19-inch mini-spare is introduced as standard equipment for the Jaguar XKR, while the weight and space-saving Instant Mobility System still takes the place of a spare wheel on other models in European markets and where 18-inch wheels are fitted as standard. Distinctive 20-inch wheels continue as a very sporty option across the new XK range - emphasising the cars' sporting dynamics and assertive, muscular looks. The new designs include two 20-inch wheels: the twin-five-spoke Kalimnos will be standard on the XKR in the UK market, and optional for all XK models in other markets. The twin-seven-spoke R Performance Nevis design is a unique option for the Jaguar XKR, and another addition to the wheel range. With the recent addition of new options Claret, Spectrum Blue, and Kyanite Blue, the stunning exterior colour range for the new XK, XK Portfolio and XKR is extended to 15; two of which - Salsa and Kyanite Blue - are reserved exclusively for Jaguar XKR. In true, contemporary Jaguar fashion, a great deal of relevant and intuitive technology is controlled by the clear and elegant seven-inch Touch-screen in the centre console - which is standard on all models. The Touch-screen provides access and control for the Climate Control and Audio systems, for the Satellite Navigation System, for Bluetooth mobile connectivity, and for Jaguar's Portable Audio Interface - which are all standard equipment. The satellite navigation system offers DVD mapping, postcode entry, and a traffic message channel. The Portable Audio Interface offers iPod connectivity, and the connection of other storage devices through a USB port, to the in-car sound system, with full Touch-screen control. The audio system options for the new XK range include single-slot or multi-disc CD changers and either Jaguar Premium Sound or the ultimate, a high-end Bowers & Wilkins system. The Bowers & Wilkins option is a 525-watt system with Dolby® ProLogic®II Surround Sound, three-channel stereo with unique amplifier, Kevlar mid-range speakers with high output and low distortion, and specially designed aluminium tweeters. Depending on market, a number of Digital Radio options are available: HD radio is available for North American market cars, SDARS satellite radio for North America and Canada, and Digital Audio Broadcasting (DAB) is offered in selected European markets.